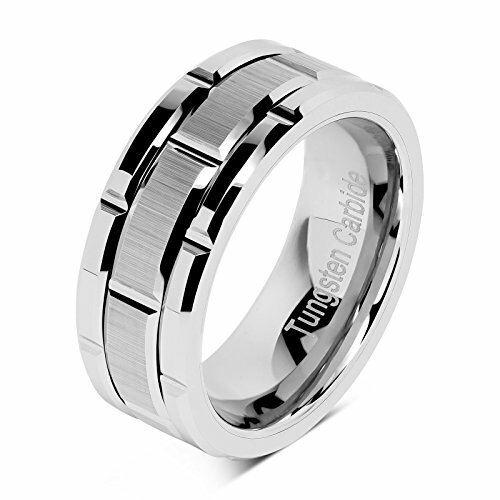 You have reached 100S JEWELRY 789545669834 100S JEWELRY Tungsten Rings for Men Wedding Band Silver Brick Pattern Brushed Engagement Promise Size 8-16 (16) in Findsimilar! Our expertise is to show you Jewelry items that are similar to the one you've searched. Amongst them you can find 100S JEWELRY Tungsten Ring for Men Wedding Band Gold Brick Pattern Brushed Beveled Edge Size 6-16, Denvosi Men Wedding Band Tungsten Ring 8MM Brick Pattern Matte Brushed Silver Surface Engagement Anniversary Ring Comfort Fit Size 6-14.5, Tungsten Rings for Mens Wedding Band Rose Gold Brick Pattern Engagement Promise Jewelry Size 6-16, 100S JEWELRY Tungsten Rings for Men Women Wedding Band Two Tones Gold Silver Engagement Sizes 6-16, 100S JEWELRY Tungsten Rings for Mens Wedding Bands Gold Silver Two Tone Grooved Center Line Size 8-16, Cavalier Jewelers 8MM Men's Titanium Ring Wedding Band Black Carbon Fiber Inlay and Beveled Edges, FANSING Mens Spinner Rings, Fidget Ring, Stainless Steel Band, Black, Silver, Multi, Size 6-15, Cavalier Jewelers 8MM Men's Tungsten Carbide Ring Wedding Band with Black Carbon Fiber Inlay, 100S JEWELRY 8mm Men's Tungsten Carbide Ring Silver Rope Inlay Wedding Band Size 8-16 Comfort Fit, DOUX 8mm Mens White Tungsten Carbide Ring Brick Pattern Brushed Center Wedding Band Cubic Zirconia Inlay Comfort Fit, all for sale with the cheapest prices in the web.